Jean-Baptiste Petitjean was born in Momant, France in 1811, just before the defeat of Napoleon. As a young boy he loved serving Mass and no one was surprised when he entered the seminary. 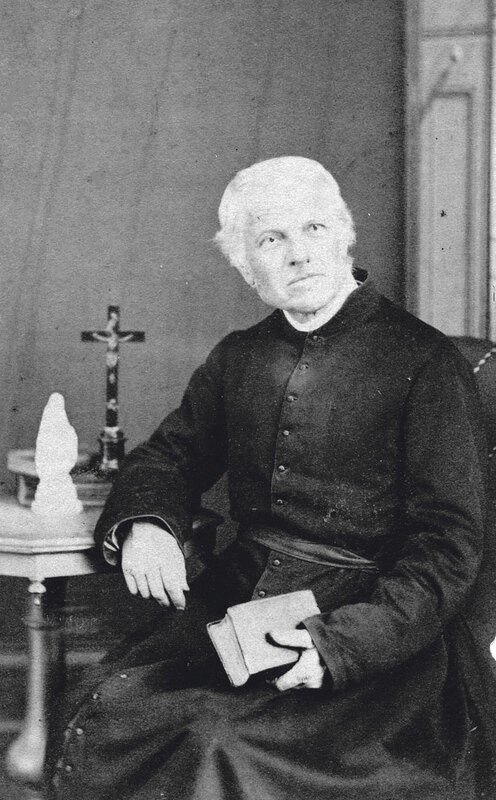 He was ordained a priest for his own diocese in February 1836 and, following his strong desire to be a missionary, joined the young Society of Mary (Marists) in 1839. Fr Petitjean was sent to Oceania with the third group of the first wave of Marists which also included Fr Philippe Joseph Viard, later to become first Bishop of Wellington (see Wel-Com, April 2013). They were received by Bishop Pompallier and their fellow missionaries. Fr Petitjean was assigned to Whangaroa, north of the Bay of Islands and, with mostly Māori people in his congregation, he quickly picked up te reo Māori. Late in 1841, a debate was arranged between the Marist priests and protestant missionaries at Kororareka (Russell). The Marists promoted Fr Petitjean as their best spokesperson and the debate was certainly popular, judging by the hundreds of Māori and other Catholic priests and brothers in the audience. More pleasant times followed for Fr Petitjean. By 1842, he was parish priest of the newly founded city of Auckland, sometimes enlisting the help of soldiers in building the first cathedral. Fr Petitjean is credited with having started the building of the cathedrals in the four main cities. Petitjean encouraged and taught at the first Catholic school in the country which had been opened by the laity in Auckland in 1841. Many Protestants attended. One practice which he continued to the end of his life was to often sleep in front of the tabernacle in the new cathedral which enabled him to hear confessions late at night. It was a great heartbreak for him when Bishop Pompallier returned to Auckland with a group of priests and sisters, to find that the country would be divided into two dioceses separated by Lake Taupo. All the land south of the lake including Stewart Island would become the diocese of Wellington and engage Fr Petitjean for the rest of his life. During the 1860s, Fr Petitjean looked after the Christchurch and Dunedin region which he initially covered on foot. Loved by all and with legendary generosity, he became known as a soft touch. When told that some abused his kindness and that his alms were spent in hotels, he replied, ‘It is perhaps very true, but God looks only on the intention.’ When told that he only gave them the means of offending God, he replied, with a wry smile, ‘Oh the wretches. I’ll give them a good penance when they come back’. When gold was found in Otago, he organised for Bishop Viard (who rarely left Wellington) to travel to the goldfields, collect a sum of gold and start building the new Wellington cathedral. In the 1860s, Bishop Viard made Petitjean vicar-general, tying him to Wellington. By now he was quite frail but unfailingly cheerful and compassionate. He looked after the diocese when Bishop Viard and even Fr O’Reily were away in Rome at the First Vatican Council (1869-70). His usual Sunday practice (remember he would have fasted from midnight), was to hear confessions before the first Mass, greet visitors often from the outer areas, chant the second Mass, then at about one o’clock he would do all the baptisms. In the afternoon after dinner he would visit the jail to minister to any Catholic inmates. He was also a regular visitor at the hospital. Preaching at Second Vespers (Sunday Devotions) ended the day. How fortunate Wellington was to have two priests at either end of the city – Fr Jeremiah Joseph Purcell O’Reily (see Wel-Com, March 2013) at St Mary of the Angels and Fr Petitjean at the (Basilica) running such a busy city. Whenever the clock struck he would bless himself, pray a short prayer then say the Hail Mary, bless himself again and resume his work. It was on such an occasion on the night of 20 September 1876 that he died quietly, while praying in front of the tabernacle in St Mary’s Cathedral, Wellington (this church burned down in 1898 to be replaced by the current Sacred Heart Cathedral). The two ‘first’ priests of Wellington Fr Petitjean and Fr O’Reily are buried together in Mount Street. Go and visit the graves sometime and pray for our diocese and city.